Yahoo Sitebuilder is a point-and-click page editor that takes all the control on its own so the menu integration is not as simple as in other html editors that let you handle the code by yourself. 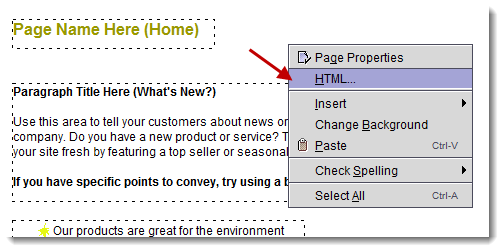 Homestead also uses a similar web editor and the following steps are also applicable for this tool. 1. Open your website in Sitebuilder. 2. Open/Create your menu in AllWebMenus. 3. Click on Tools and then click on Compile Menu. 4. Compile your menu (menu.js) inside your yahoo site class="margin-bottom-20" directory (choose that directory as the menu's "Web Site Root"). 5. Click on "Link menu to web pages". 6. Choose the "...give me the code to add it myself" tab and copy the code from there. 7. Highlight your code and copy it to the clipboard (press Ctrl-C). 8. In Sitebuilder open the page where you want your menu to appear, right-click somewhere in the BODY (not on an element) and click the HTML option. 9. Go to the "HTML After Body" section and paste the HTML code you copied. 10. This links your menu to your page. 11. Save your web page. 12. Go to the file listing in Sitebuilder and click on "refresh". 13. Your .js file and a subdirectory called "awmdata" should appear. 14. Publish all these online and your menu should appear. It will work for any type of menu created. - If you want your menu to appear exactly where you put your HTML Snippet be sure to make Horizontal and Vertical Distance from Edge value=0. The movement of your HTML Snippet in Sitebuilder will determine where your menu appears. - Later, each time you make a change to your menu just compile and replace your compiled menu (no linkind is required for updating the menu). Then publish the .js file again. - Do not choose the automatic "menu-linking" process because Yahoo Sitebuilder always wipes out the AllWebMenus linking code. That's why we will use the HTML Snippet function instead.